Two passionate cooks live at my house. Both my husband Howard and I love to experiment in the kitchen. We have completely different approaches though. I am the Luddite. Aside from combining ingredients in the food processor, blender, or stand mixer, it’s a mostly manual process. On the other hand, for Howard, it’s all about the technology. He’s been into sous-vide cooking for years, first assembling his own water immersion unit, then recently buying a more professionally built one. He has a hefty vacuum sealer and the Modernist Cuisine library. The most recent addition to his arsenal is a pressure-cooker. Pressure cookers aren’t actually new-fangled, or even electric, in this case, so I suppose it’s debatable whether it’s a truly high-tech device. 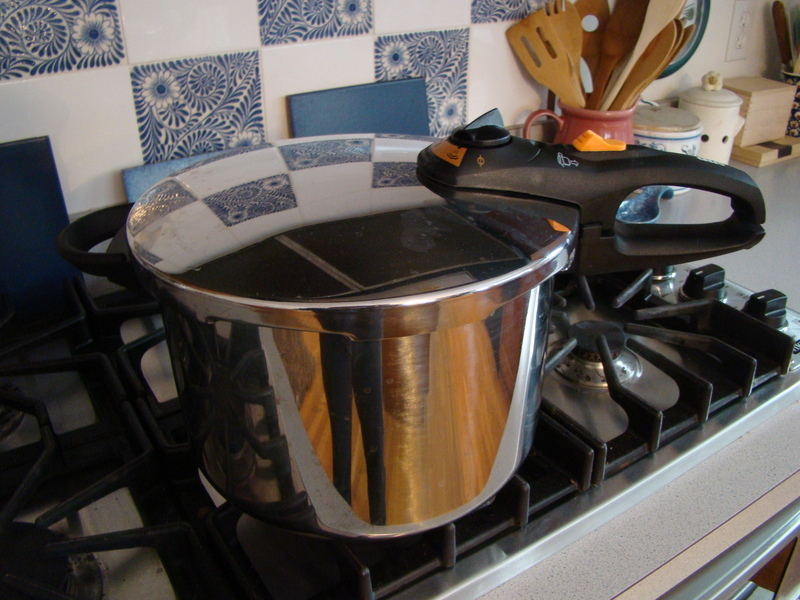 All I can say is that the idea of pressure cooking has always terrified me. I always imagine a resulting explosion and food all over the kitchen ceiling. I’ve been assured by kitchen shop salespeople and more fearless cooks than I that current pressure cooker designs make disaster unlikely, but I’ve had my doubts. Howard did extensive research, and we visited multiple kitchenware stores. The winner was a Fagor Duo (also a top pick by Cooks’ Illustrated). So, what to make as the debut pressure cooked recipe? Howard’s research indicated risotto would be an excellent choice. 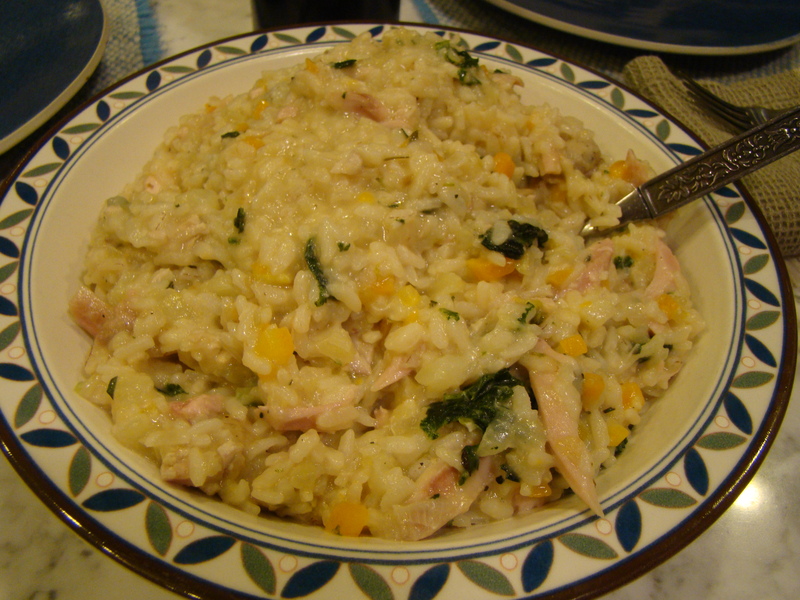 We have always enjoyed risotto, at home more than in restaurants. I make it somewhat regularly, though not often. There are infinite variations. It’s the perfect vehicle for leftovers. But all that stirring? It’s time-consuming. Howard told me that once all the chopping was done, risotto in the pressure cooker would take only 7 minutes, unattended. Humph. That seems work a try, as long as he was in charge of the pressure. We started with a basic risotto with onion, garlic, carrots and fennel. To turn it into a meal, we added assorted leftovers at the end: shredded turkey confit, mashed rutabaga, and braised kale. It worked. Once the pressure was reached, Howard turned the heat down just a little to stabilize things. Seven minutes later, the rice was perfectly moist and cooked through. Amazing! I like knowing that when we’re short on time, we can make such an elegant and easy dinner from pantry items and added inspiration from the leftover stash in the refrigerator. Who would think? In the pressure cooker base, heat the oil over medium heat. Add onion, fennel, carrot, and garlic. Cook until tender and translucent, about 3 minutes. Stir in the rice so that it coats with oil and starts to turn translucent, about 2 minutes. Add chicken stock and sherry and stir. Pressure-cook on high for 7 minutes. Start timing when full pressure is reached. Depressurize the cooker. Taste for doneness. If it isn’t quite done, simmer for a few more minutes, uncovered, no pressure. Stir in fresh herbs and season to taste. Fold in any additional ingredients and serve.